A lot of people ask me for my meal plan or more specifics on what I ate during the challenge. It’s a complex answer, involving determining your basal metabolic rate (the amount of calories you burn per day at rest), logging your food intake and exercise burn, and tracking macro nutrients. There isn’t one right answer for everyone. But there are some underlying truths that work for everyone (tracking calories, eating clean, increasing protein, reducing sugar, etc). I learned so many of these during my challenge, that I want to start sharing – including the details about what I buy, prepare and eat. Because healthy eating begins with better shopping, I thought in my first post, I would highlight some of the products that I could not have lived without – both during the challenge and now to maintain my results. For this particular post, I’m going to focus only I products found at Costco. This post is not sponsored, but I admit that I do have a Costco bias. 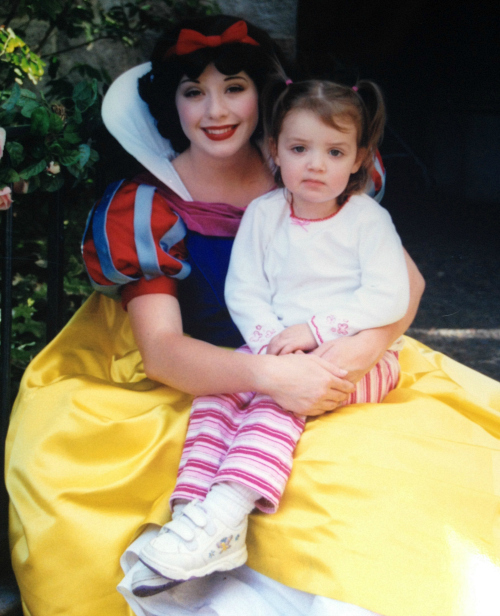 My first job out of college was at Costco and I’ve been in love ever since. The quality of the organization – from the way they pay/treat their employees to their liberal return policies, it’s just a really good, solid company. Plus their quality standards for the items they sell is top-notch. I also shop at Whole Foods, Trader Joe’s, Mother’s Market, Sprouts and local Farmers’ Markets (I pretty much avoid any traditional grocery stores unless I absolutely have to for convenience sake) – but for the staple, go-to items, you can’t beat the price and quality of Costco. They have so many more organic products these days. Their produce is the very best of any store – IMHO. Combined with the fact that it’s the absolute best price per pound (yes, you usually do buy more pounds of it), you can’t go wrong. 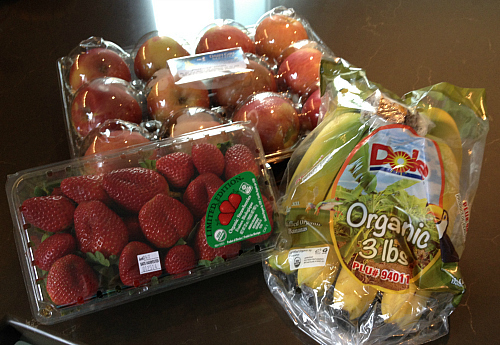 Organic Produce – The organic produce varies from store to store and season to season, but on my most recent shopping trip, I found organic apples, organic strawberries, and organic bananas all in one trip. Score! Plus, these organic strawberries were so good. Like 1000 times better than the ones I purchased at another store the week before. Yes, it’s quite a bit of strawberries, but you can make them last. As soon as you get them home, wash strawberries (or any berries) in a solution of one-part white vinegar to ten parts water. You won’t even need to rinse them. The vinegar smell subsides quickly. Your berries will resist molding and last twice as long – I promise. 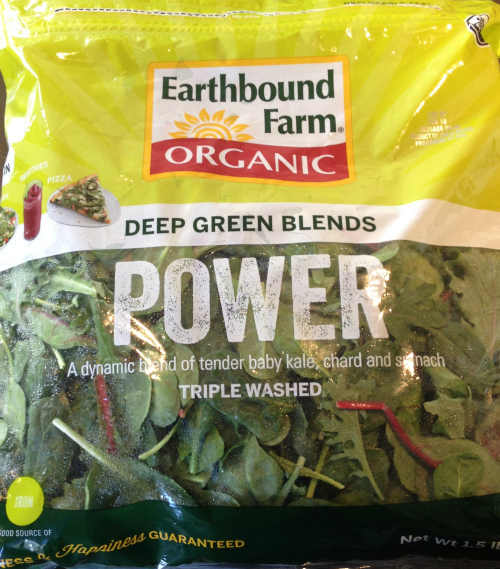 Earthbound Farm Organic Power Greens – I eat a salad almost every day, and almost every salad starts with this base. It’s quick and easy, organic and healthy – plus the baby kale is much easier to eat straight out of the bag, without any further cooking, rubbing with oil, etc. I even throw this mix in my smoothies. It is a must-have. 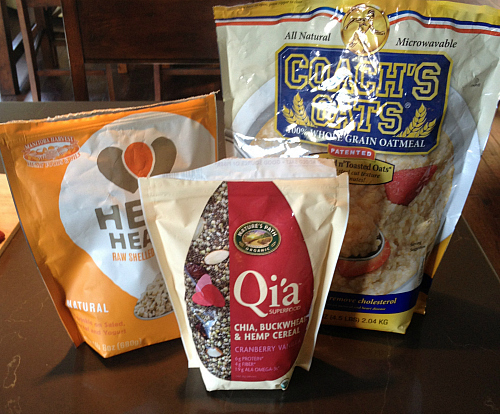 Healthy Grains – Here are three of my favorite Costco items. Coaches Oats (the best oatmeal ever), Qia (an organic cereal that is a mixture of the power foods chia, buckwheat and hemp) and Hemp Hearts (the most nutritious part of the hemp seed. I sprinkle on cereal, salads and yogurt). Organic Chicken – You can not beat organic chicken breasts for $5.99 per pound. 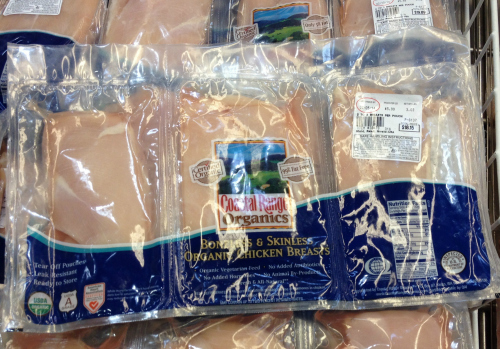 You can purchase this fresh or frozen (in individual packets so you can pull out one chicken breast at a time for defrosting). You can also purchase organic drumsticks and whole organic chickens for roasting. Organic Eggs – I’ve written about this before – egg whites are my new BFF. Quick, easy, packed with protein, and very low in calories. I cook up a batch every week and grab them when I need a quick snack, or add them to my salads. 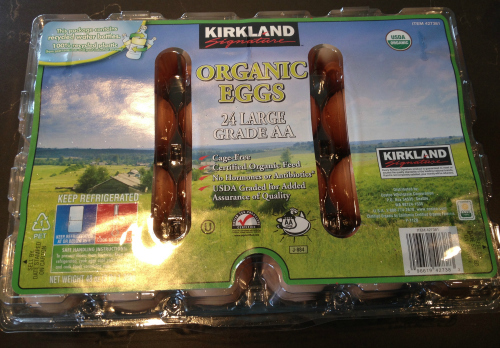 Costco’s eggs are certified organic, cage-free, and now (hallelujah) come in a recyclable plastic container that is made from recycled water bottles. What more can you ask for? 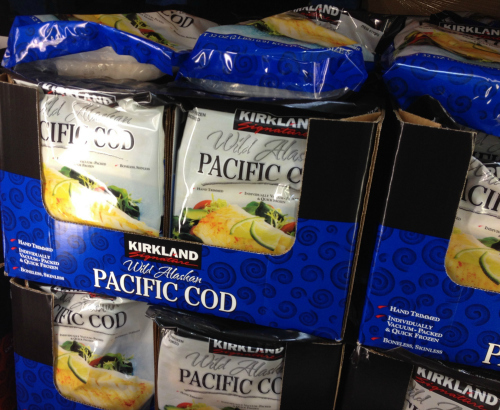 Sustainable Seafood – Costco is one of the largest suppliers of sustainable seafood in the country. They took great strides a few years ago to ensure that all the fish in their stores is certified by the Marine Stewardship Council, the most recognized independent group certifying sustainable fisheries. Fish is a dinner staple. I buy Wild Alaskan Salmon, Wild Halibut, and my kids’ favorite, the very mild tasting Wild Alaskan Pacific Cod. 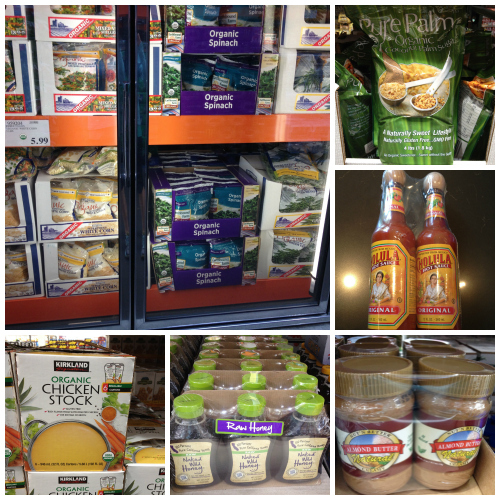 Although the inventory can vary from time to time, you can also find all kinds of additional healthy, organic products. Here are just a few that I ran across on my recent shopping trip. From a vast selection of frozen organic veggies, to organic acai, to raw honey and almond butter. Also, there is the greatest condiment of all time – Cholula. It has the power to turn almost anything (but especially scrambled egg whites) into a gourmet meal – yes, I’m a little obsessed. Your local Costco is serving up all kinds of organic fare – in bulk of course, but if you have the storage space (or hungry teenagers) you can not beat the quality and price. One final note about packaging. My only issue with some of the Costco products is that there is too much packaging. So, I purchase selectively and am hyper-vigilant about reusing and recycling. We reuse bags, cartons, rubber bands, virtually anything that we can find another use for. Cardboard and plastic all gets recycled so very little (primarily just shrink wrap) ends up in the trash. Coming up in future posts, examples of what to eat, from breakfast to lunch to dinner. Also, recipes that are family-friendly and challenge-friendly. If there are any questions you have or things you want me to cover, let me know in the comments below or just send me an email. Posted in My 12-Month Challenge and tagged Costco, diet, green, health, nutrition, Orange County, organic, organic products, shopping. Bookmark the permalink.